Re: The WWE/TNA Prediction League Season Standings! Wow. OK so this is it, we're going into the final event of the season. I sure hope SummerSlam has a LOT of bonus point potential because I need to out-score Snoopz by five to tie or six to win. haha. That should be the final standings for the season. Goyf was one point away from tying and Swift managed to crack the top 3 at the end. Pretty incredible to see, all things considered. Helluva run, most surprised to see Swift go from the perpetual 4 point score to a top three finish, and a hats off to you for being one of the few to top me over all the years I've hosted this game! A worthy adversary for sure, and I look forward to the next one! Fwiw, I do plan to continue this. I'm waiting for another league to finish up (iirc in December), and then I want to combine this across multiple platforms to make the greatest league and largest in fed history! Royal Rumble / TakeOver predictions going up on Friday. Season will run from this year's Rumble, and conclude with the 2019 Rumble! iMPACT! 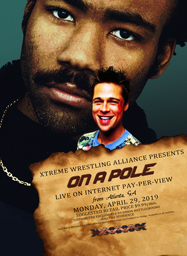 Wrestling's two Pay-Per-Views (Slammiversary and Bound For Glory) will be counted, assuming there are no episodes of TV taped for after the show looming in the spoiler sheets. I will carry points over in a google docs sheet (as I am scoring people from multiple forum sites around the internet that I frequent), and the person with the highest points at the end of Rumble '19 will win this season year!